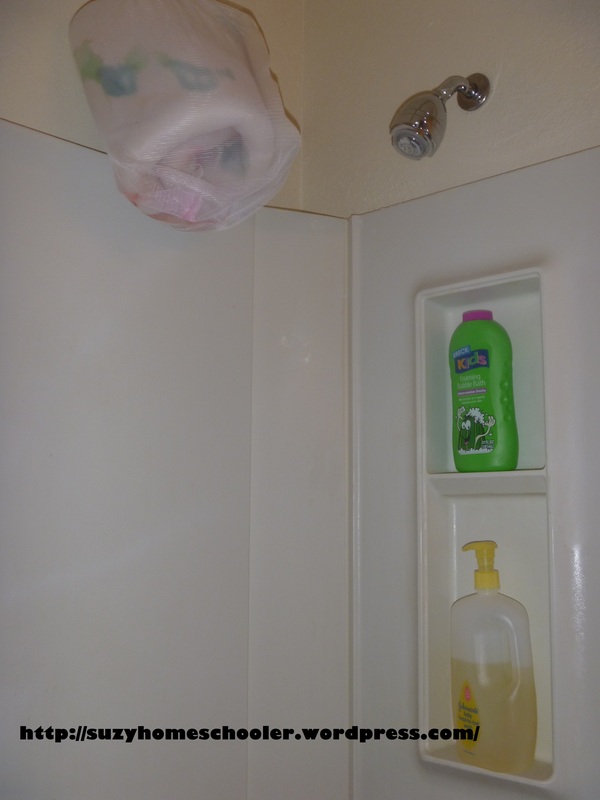 Its actually quite nice to have a bathtub and sink handy for clean up after those particularly messy projects. 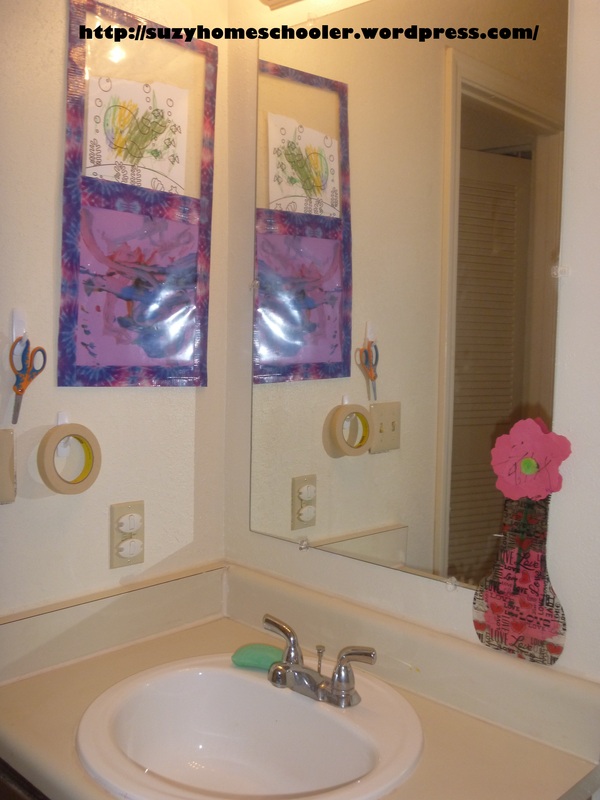 Besides having hooks to keep scissors and tape handy, we also have page protectors framed by duct tape and hung on the wall, this is an easy and affordable way of displaying the children’s finished works. 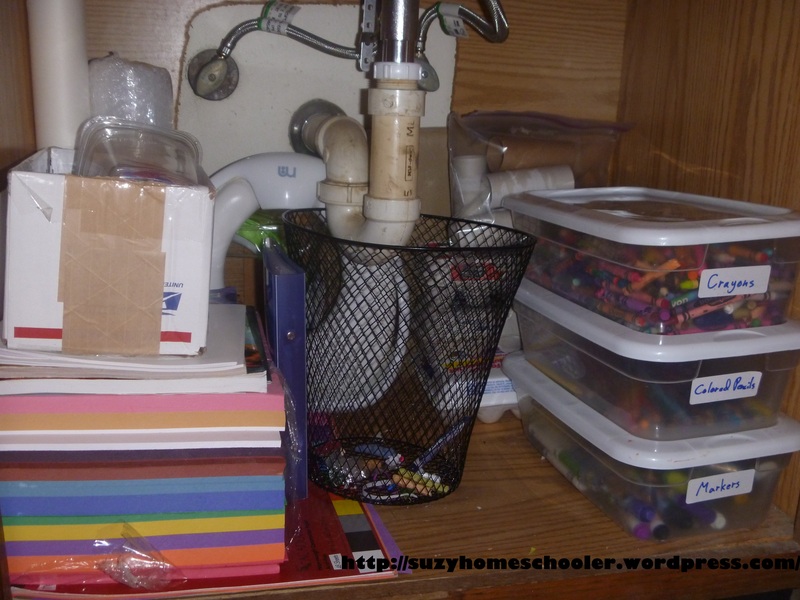 Under the sink we keep a large roll of paper, a roll of bubble wrap, sheets of construction paper, coloring books, a box of paper scraps, a trash basket, empty egg cartons, empty toilet paper rolls, markers, colored pencils, crayons. Next to the sink is the toilet, which we have never used as a toilet. 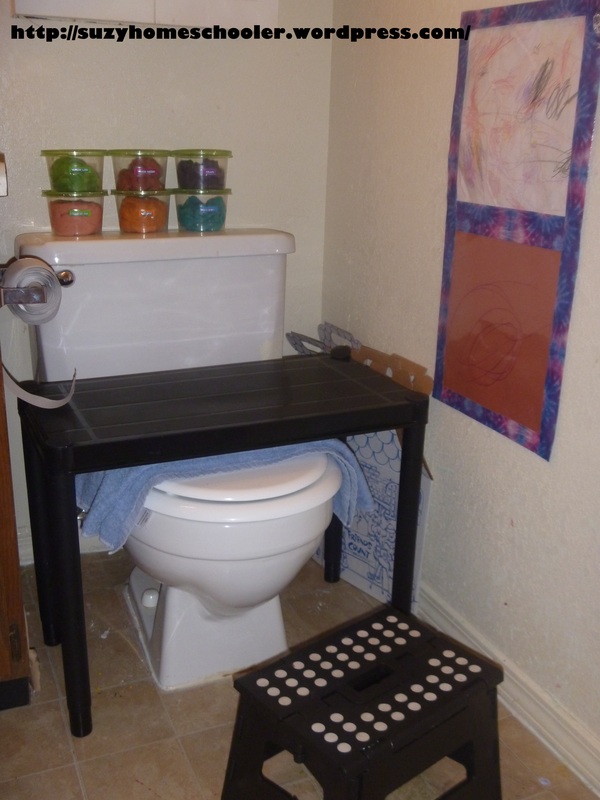 We keep a small table over the toilet and use it as a creative table workspace. [We have another creative table workspace in the home, however its located in a carpeted room and generally used for less messy mediums.] Between the underside of the table and the toilet lid you can see a blue towel, we like to have this handy in case of spills. To the side of the toilet you can see we have a couple white boxes flattened and kept on hand for future projects. 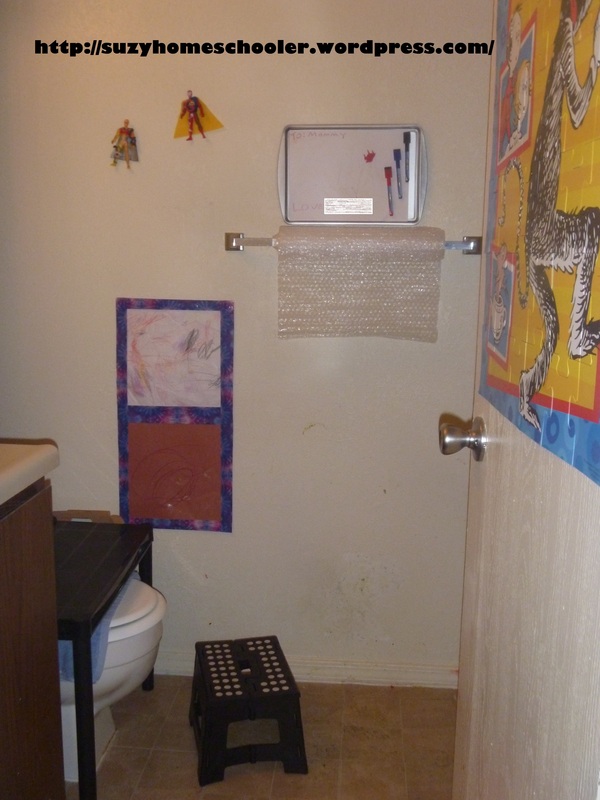 In front of the toilet is a step stool, primarily used as a seat for our 4 year old, though occasionally moved and used to reach the sink. We also have more finished work displayed in page protectors on the wall. 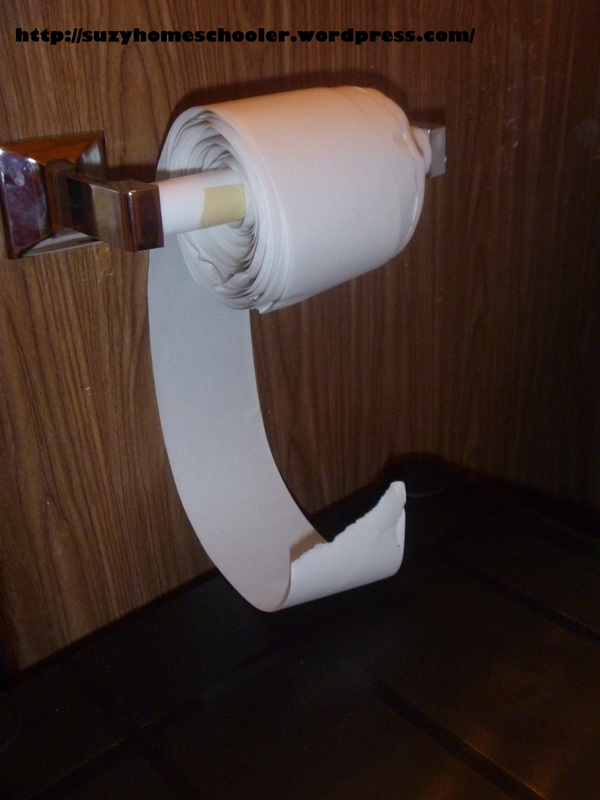 Instead of toilet paper, we’ve hung a roll of receipt paper, mainly used for testing coloring and techniques before applying them to whatever project LittleMan maybe working on. 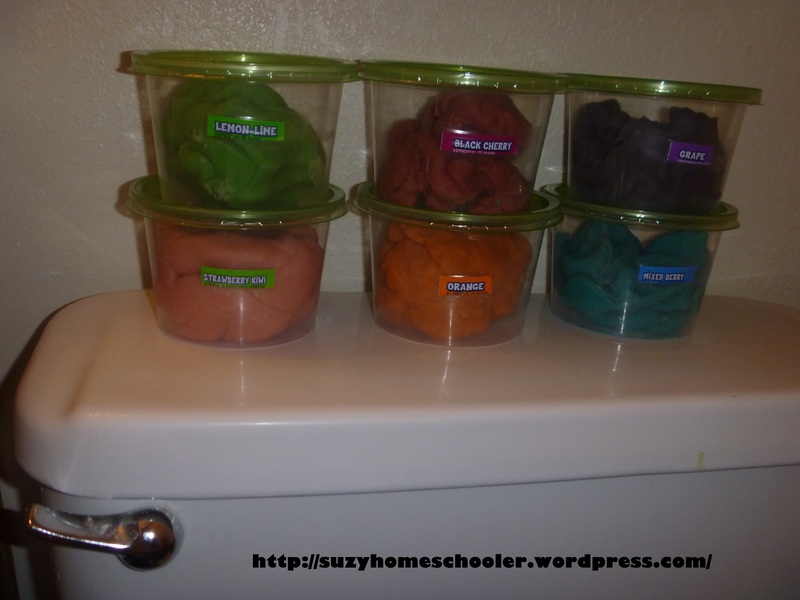 On the back of the toilet, we’ve utilized this space for keeping playdough handy. 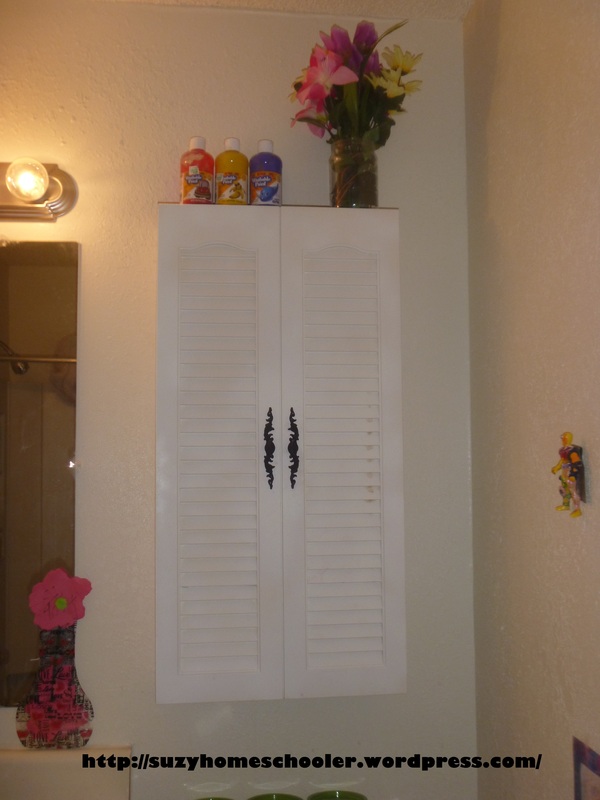 Above the toilet is the medicine cabinet, we store our big bottles of paint on top. 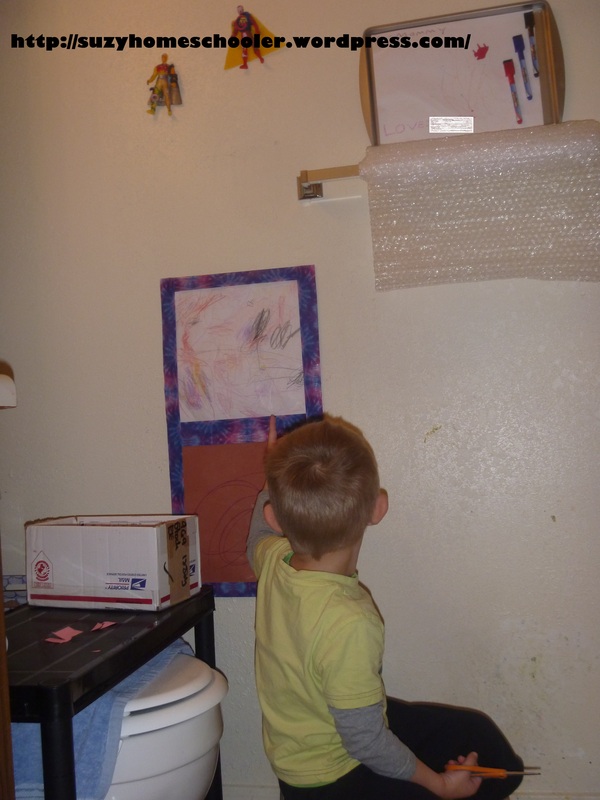 I trust LittleMan to have them where he can reach them, unfortunately its difficult to leave certain things out for LittleMan as SunnyGirl is still too young to have un-monitored access to paint, glue, etc. Next to the paint we keep our silk flowers. The only reason those are up so high is because we just don’t use fake flowers very often. 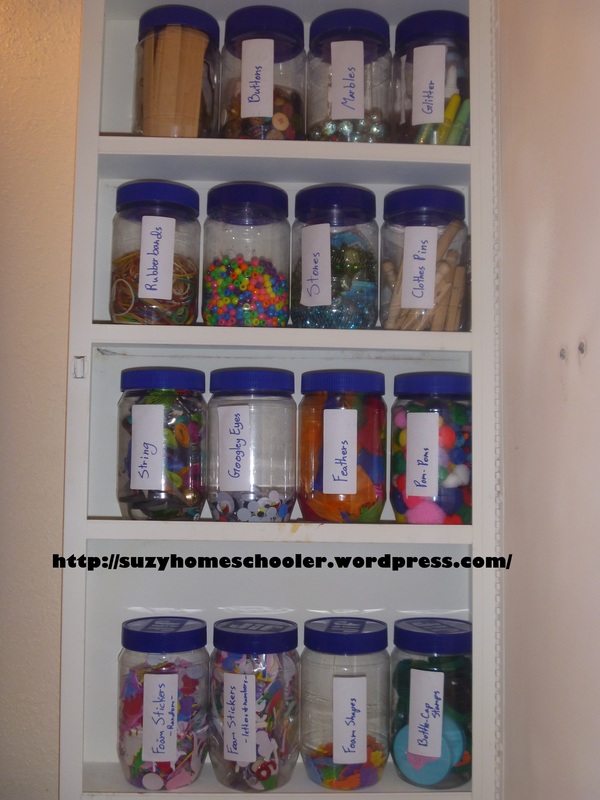 Inside the medicine cabinet we have jars of crafting supplies. From left to right and top to bottom: popsicle sticks, buttons, marbles, glitter, rubber bands, beads, glass gems, clothes pins, string, googley eyes, feathers, pom poms, foam stickers, letter and number stickers, foam shapes (non-adhesive), bottle cap stamps. On the wall directly opposite the door is the towel rack, a baking sheet, and two action figures (Captain Creativity and Inspire, more on them in a post yet to come). 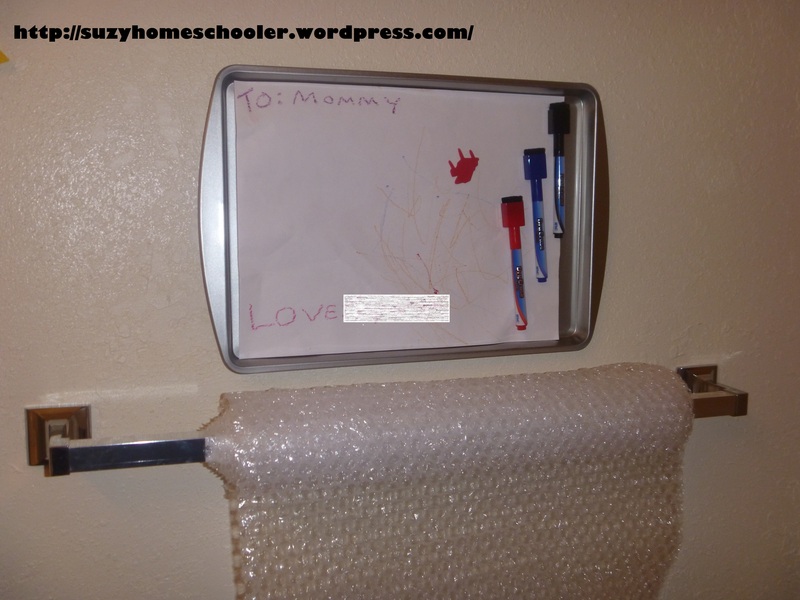 We hang bubble wrap from the towel rack, and the baking sheet has multiple uses. Right now the baking sheet is displaying something SunnyGirl colored while with our sitter. Besides art display, the baking sheet can also be used as a dry erase board. Its attached to the wall via velcro strips so we can take it down and use it for magnetic work sheets. Sometimes I might post a picture up there for LittleMan to be inspired by. On the wall opposite the toilet and sink is the bath tub. We do alot of themed baths in our home, this is where that happens. 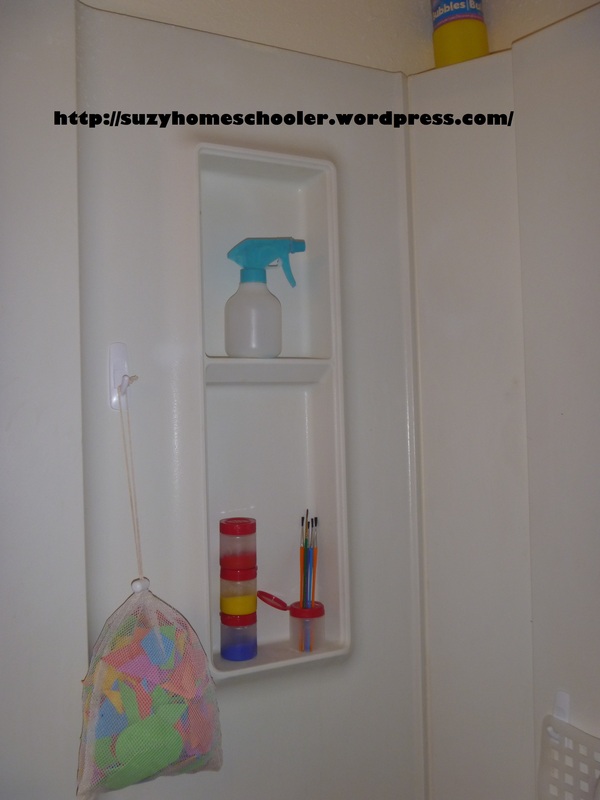 A bottle of bubbles (yellow, top of the pic), a spray bottle, paints and brushes, a bag of foam shapes are all things we like to keep handy in our bath tub. We also have a small water wall made entirely made from objects bought at DollarTree (have I mentioned thats my favorite store?). 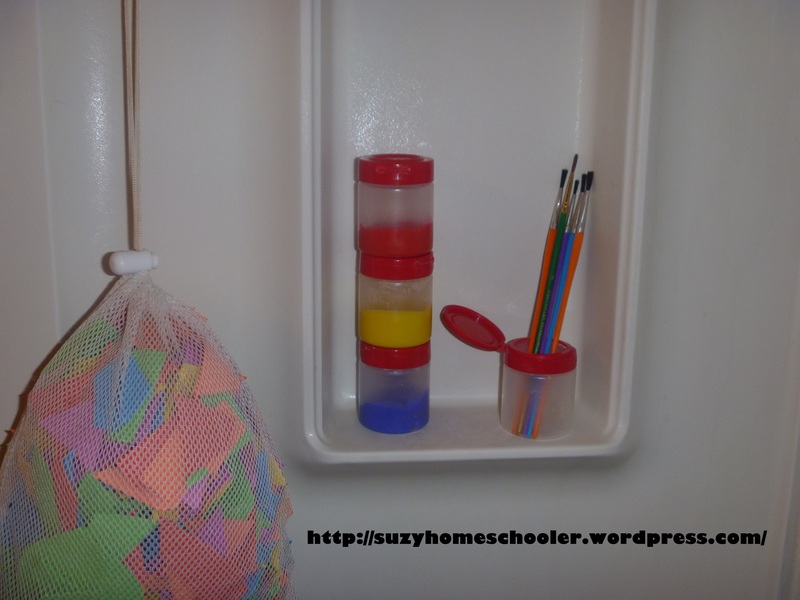 It may not look like much to you or I, but both LittleMan and SunnyGirl get alot of use out of those funnels and tubes. Of course you can’t have a bath without soap. We also keep a giant sponge handy (this might sound odd but it’ll be explained in a future post). 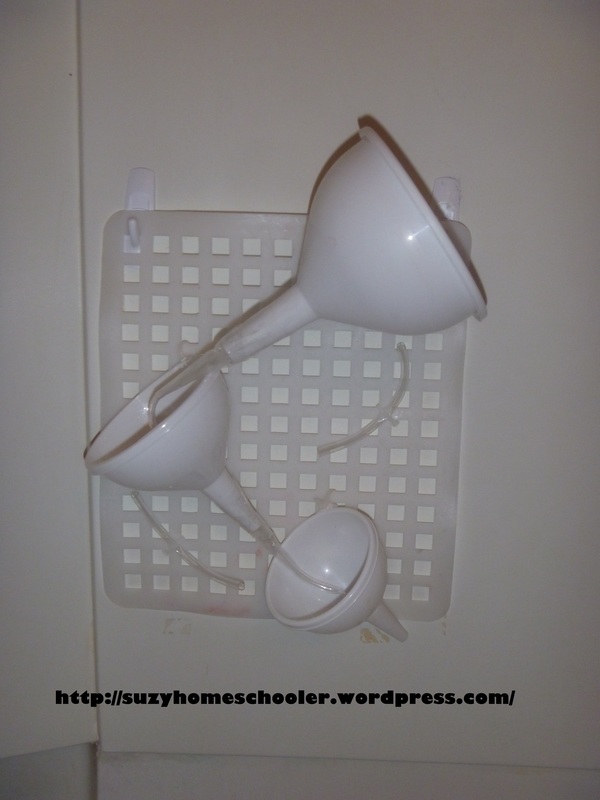 In such a small space, storage can be difficult. 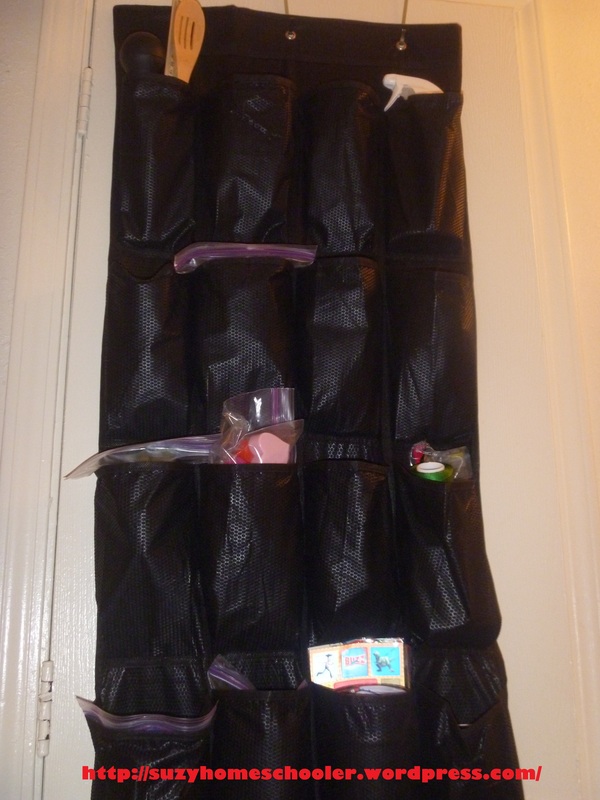 We use a shoe organizer which hangs on the back of the door. Cleaning supplies are all the way at the top, stickers and glowsticks and the like are towards the bottom. 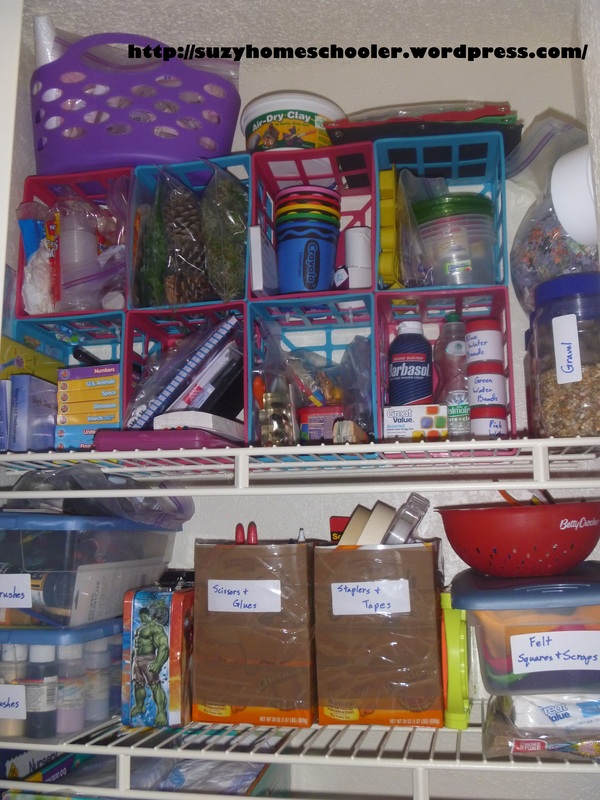 We also have a small linen closet literally right outside the door, we utilize the upper shelves in this closet for art, science, and other homeschooling supplies. Left to right, top to bottom: soap making supplies, clay, name bags, rubber gloves, small empty containers, silk leaves, plastic seaweed, pine cones, moss, oil pastels, cups, receipt paper, playdough making supplies, puzzle pieces, measuring cups, measuring spoons, working stethoscopes, magnifying glasses, flashcards, paper letters, boggle cubes, small notebooks, paper, pens, preserved insects, items we’ve been collecting for our continent boxes, shaving cream, food coloring, empty soap bottles, dehydrated water beads, gravel, stones, paint brushes, paint, Avengers Literacy Kit, scissors and glue, staplers and tape, stencils, pipe cleaners, colander, felt scraps, paper bags. 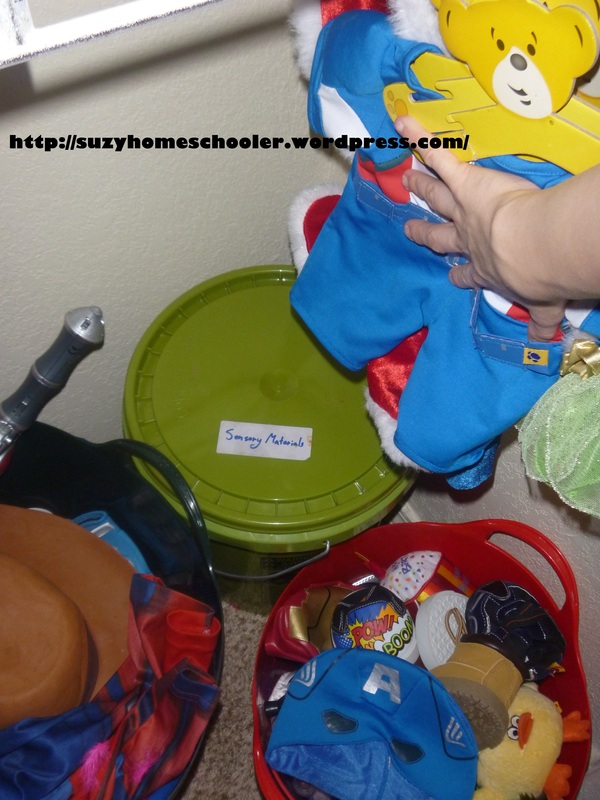 We do alot of sensory bins so we needed a place to store all the rice, beans, shredded paper and the like so we tucked it all away in a 5 gallon bucket all the way at the bottom of the closet, behind the kids’ dress-up and teddybear dress-up costumes. Thats it. Might not seem like much but its our favorite room! Big thank you goes out to Tinkerlab for inspiring me to post about our art room with her recent post, Evolution of the Art Table. If you haven’t checked out her site yet you should! Its been awhile since she’s posted a creative table challenge but I recommend browsing previous challenges for fun ideas. Another great place to look around and get the creative juices flowing is her #creative table group on Instagram.